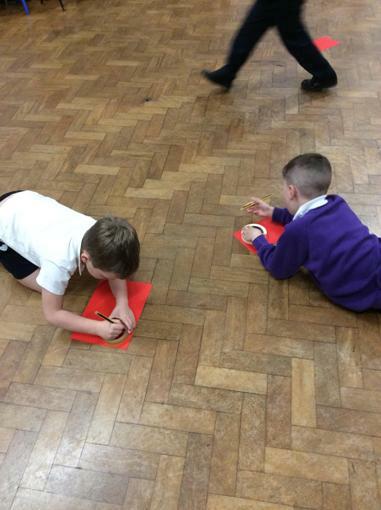 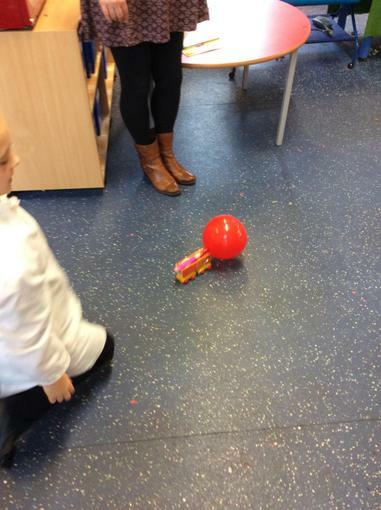 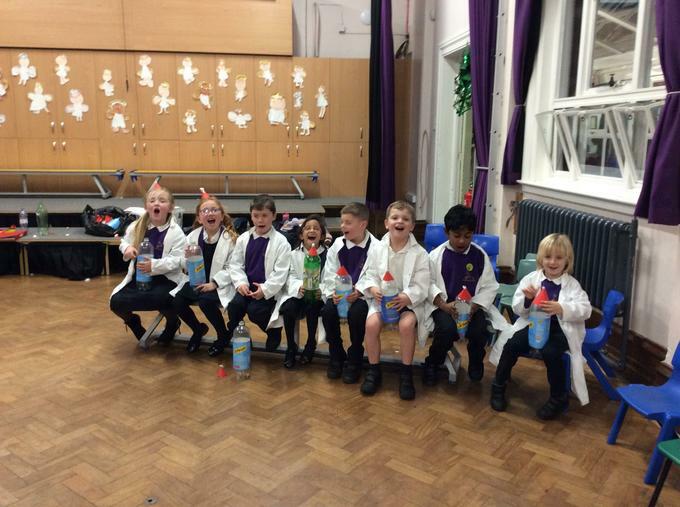 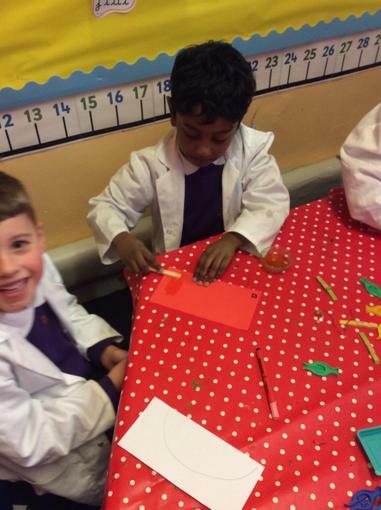 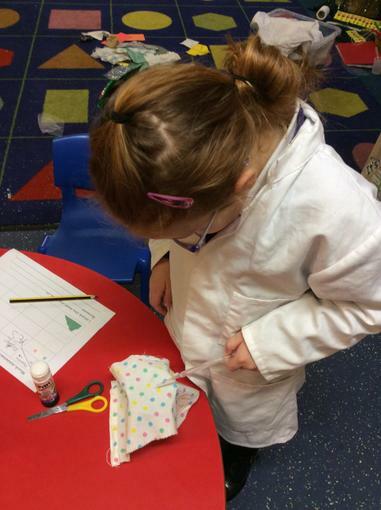 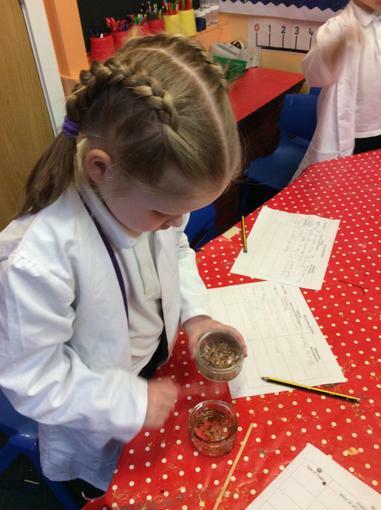 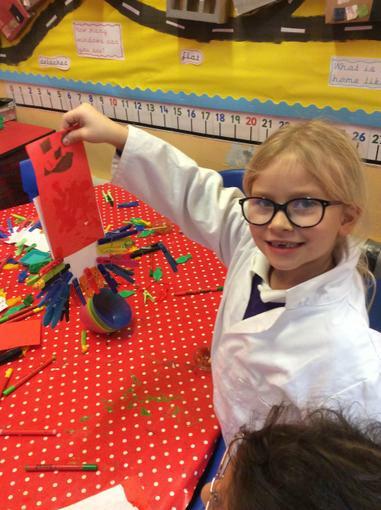 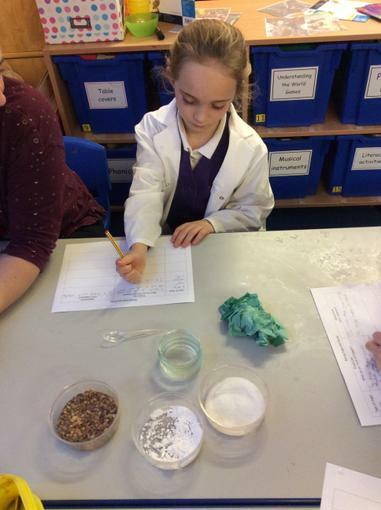 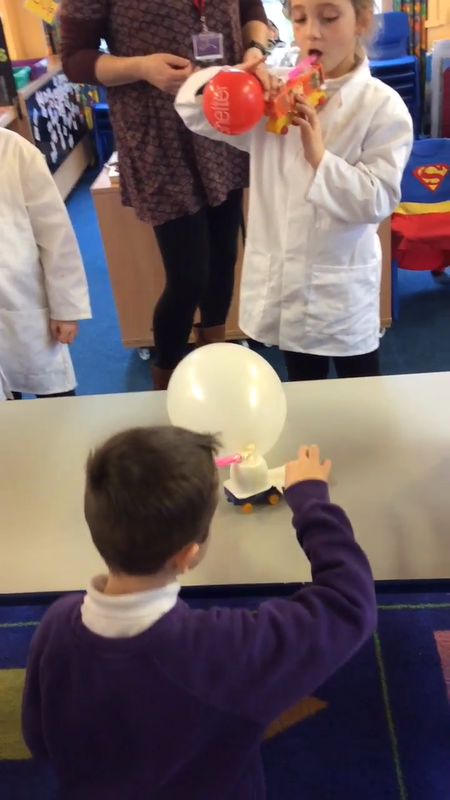 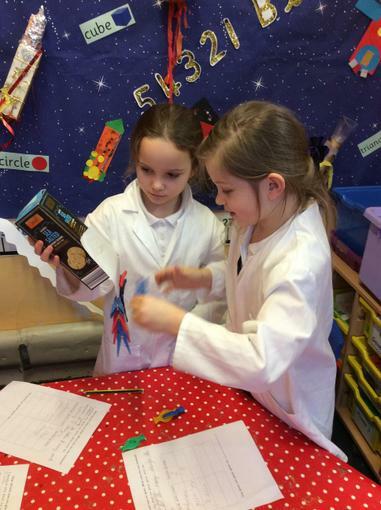 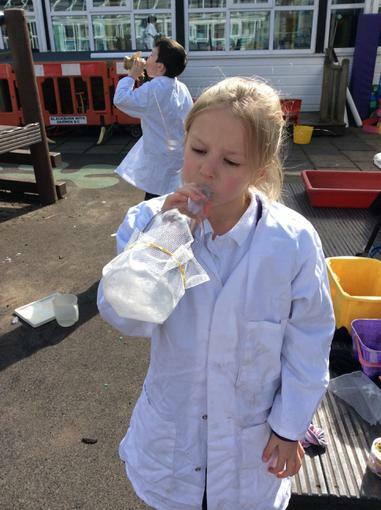 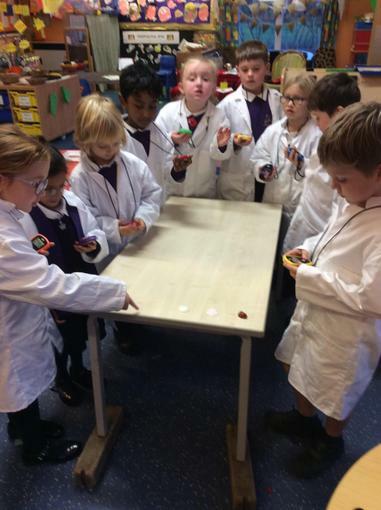 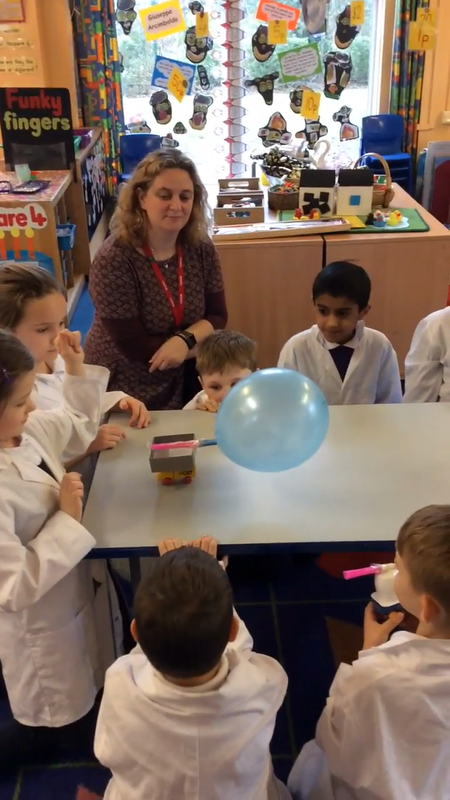 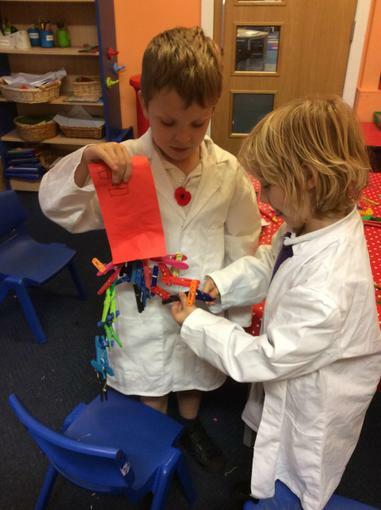 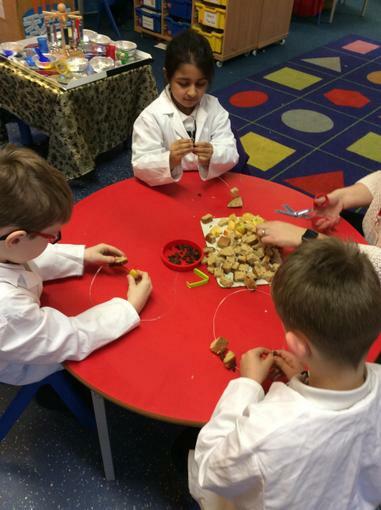 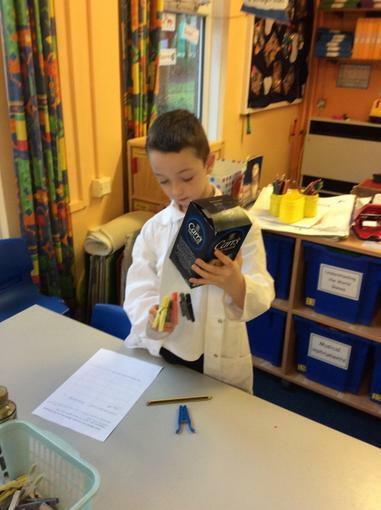 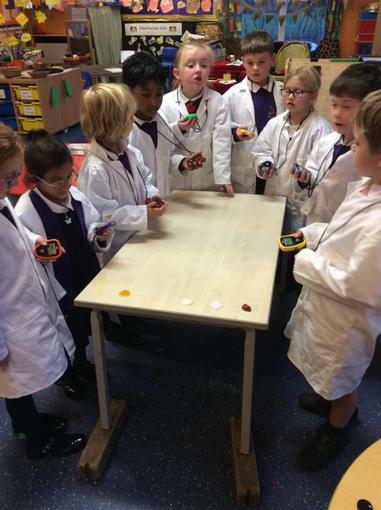 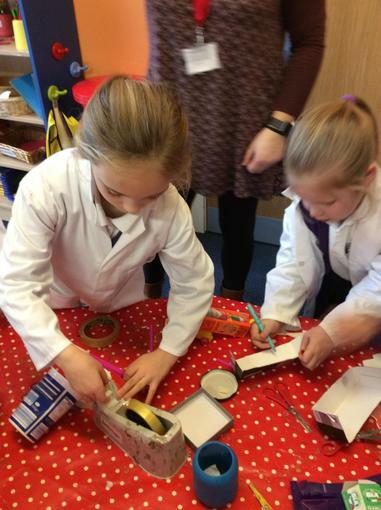 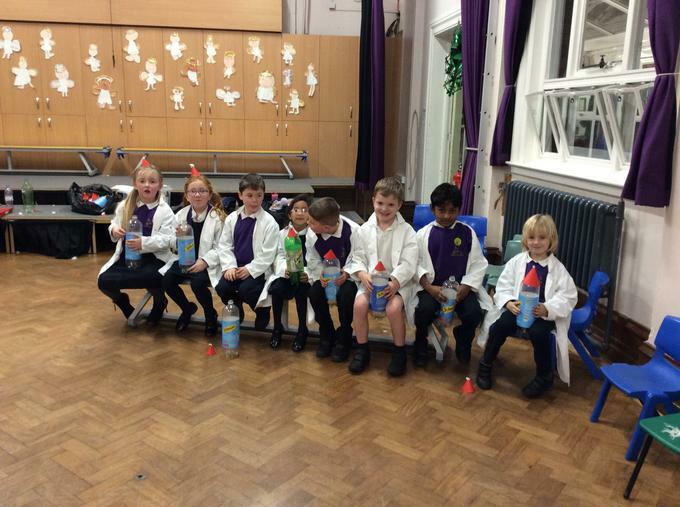 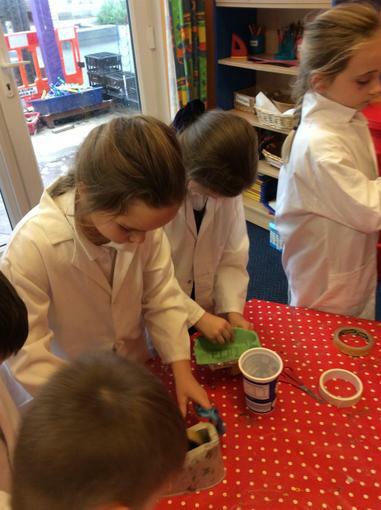 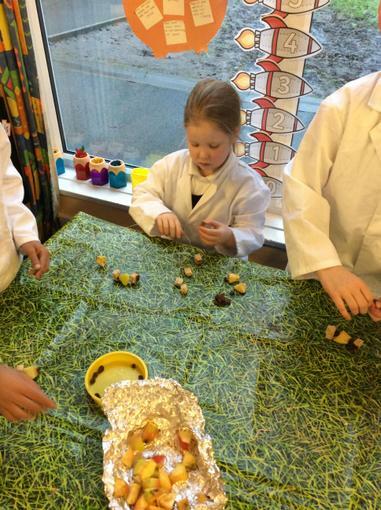 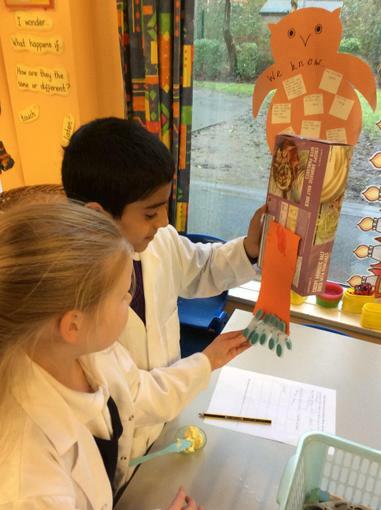 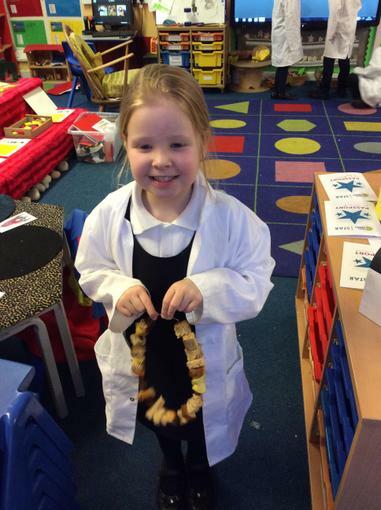 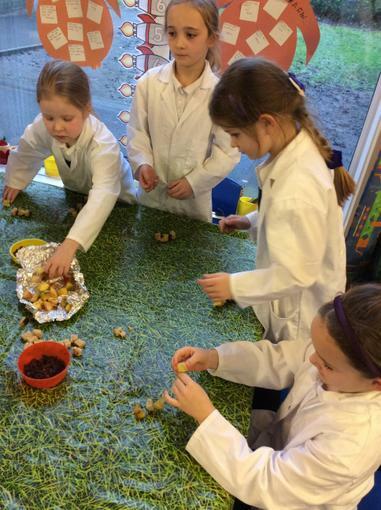 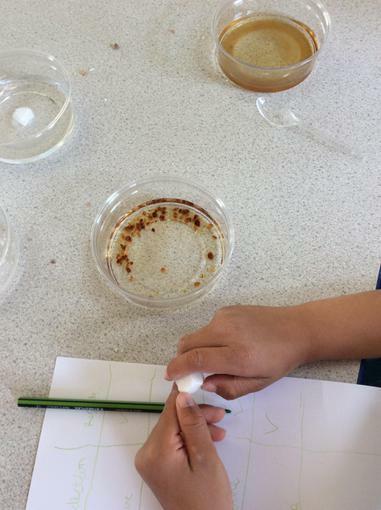 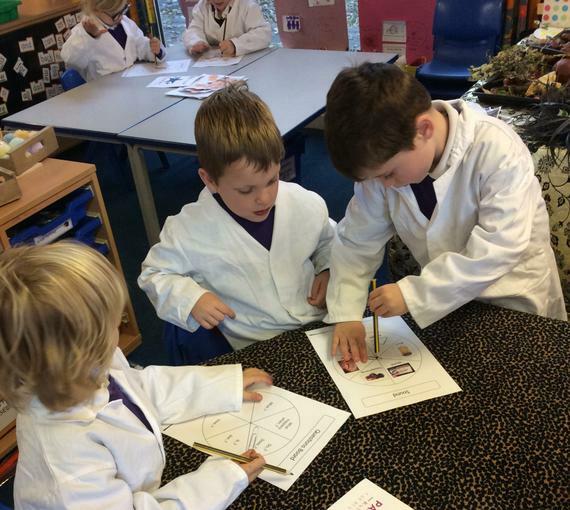 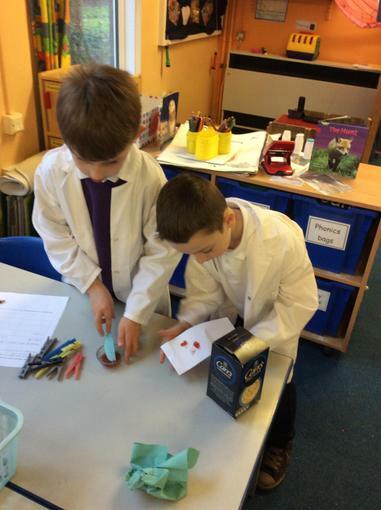 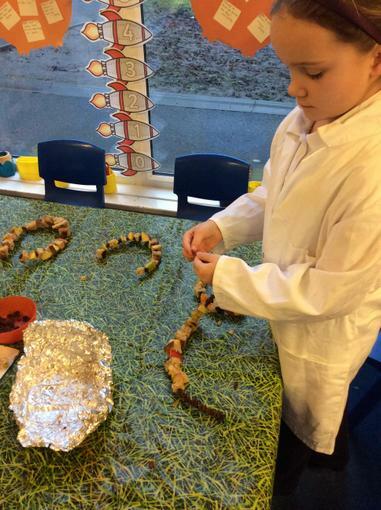 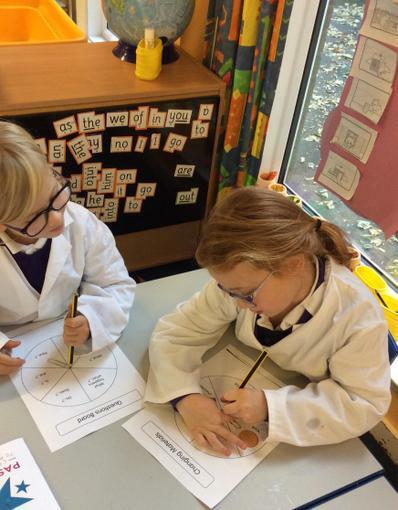 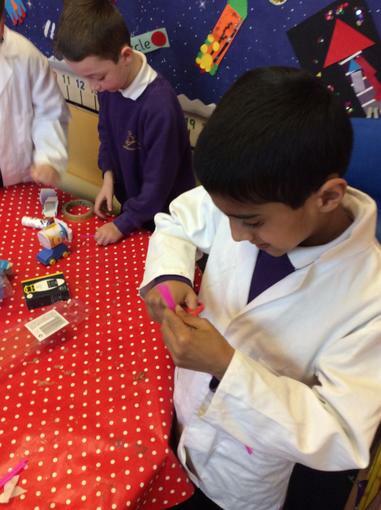 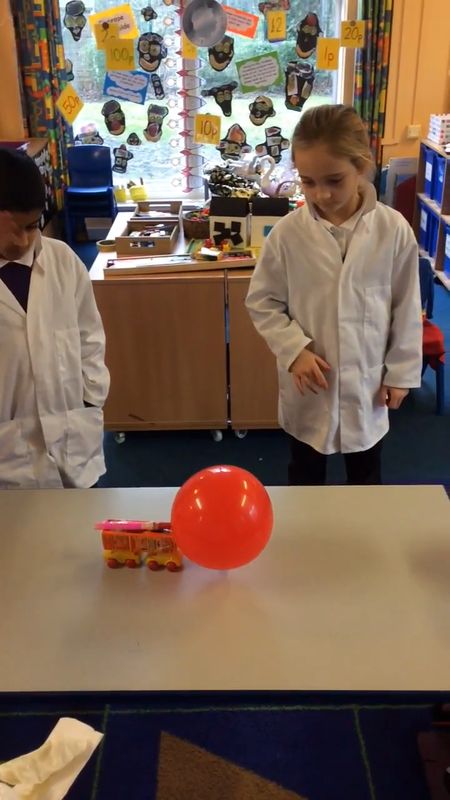 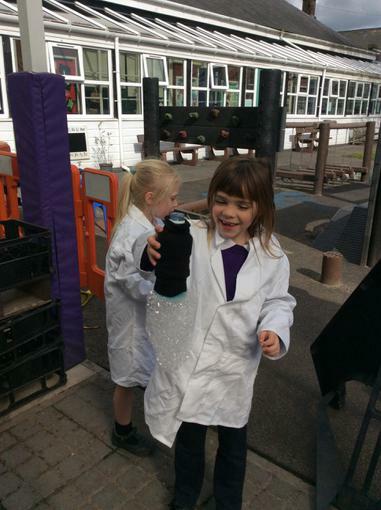 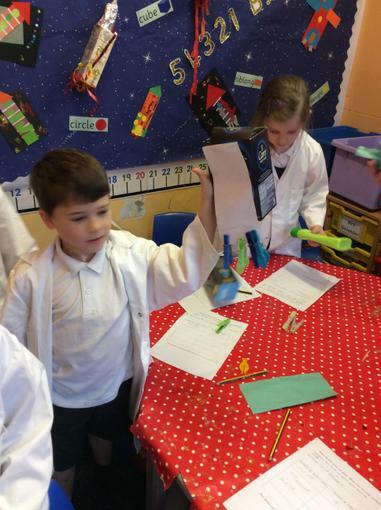 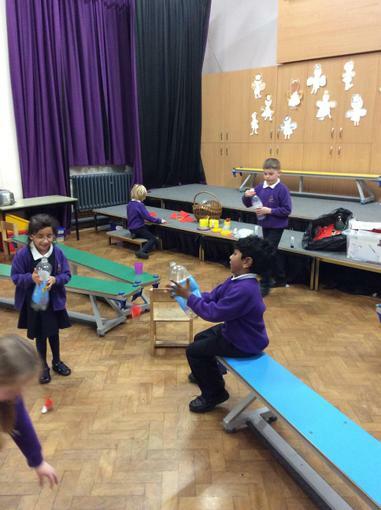 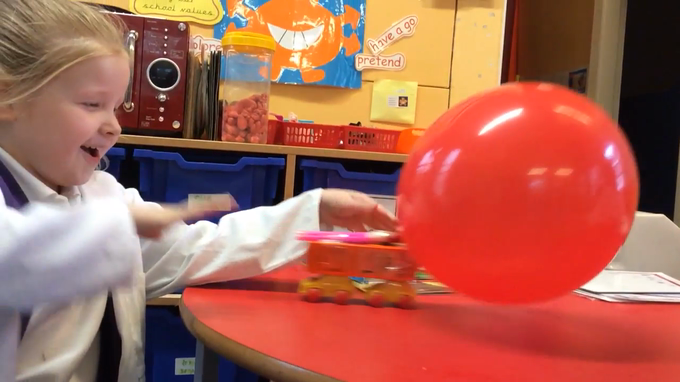 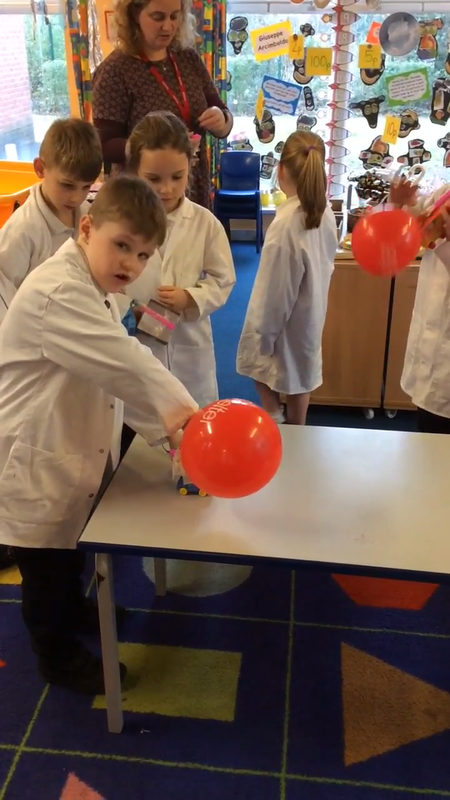 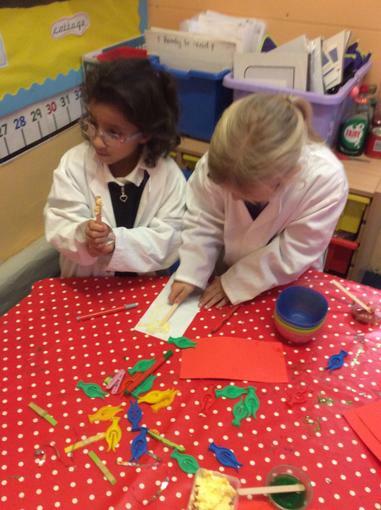 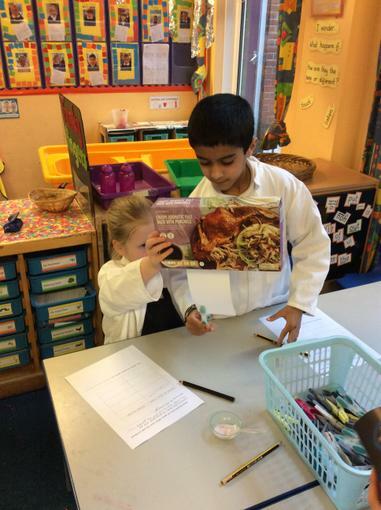 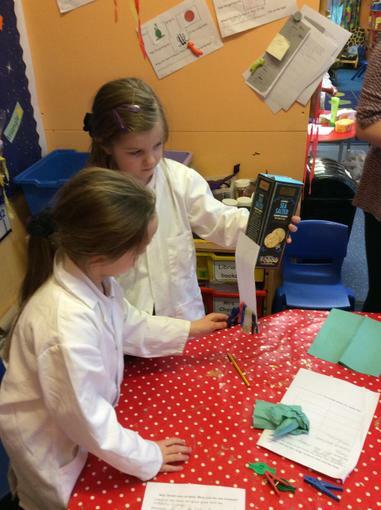 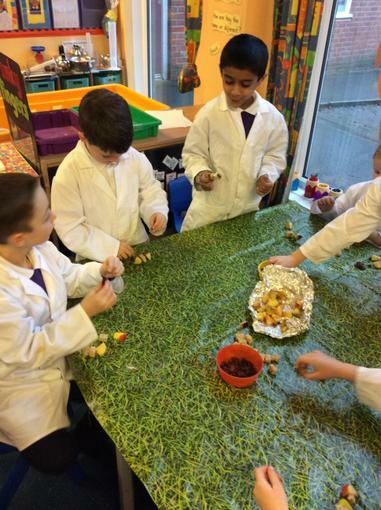 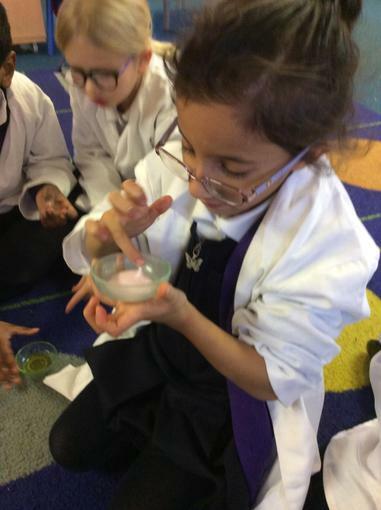 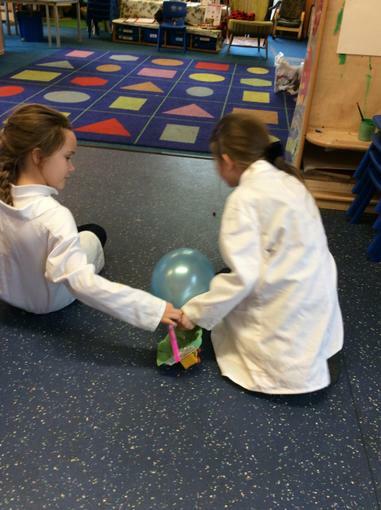 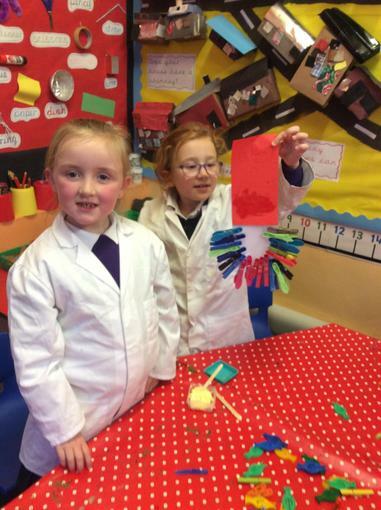 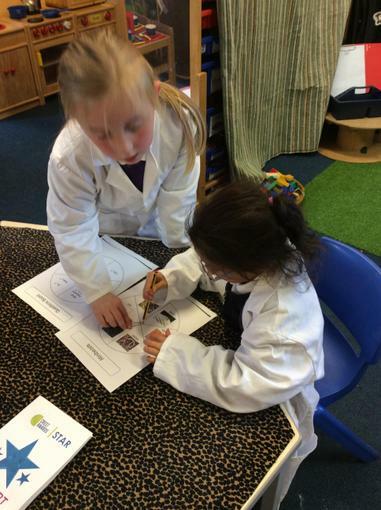 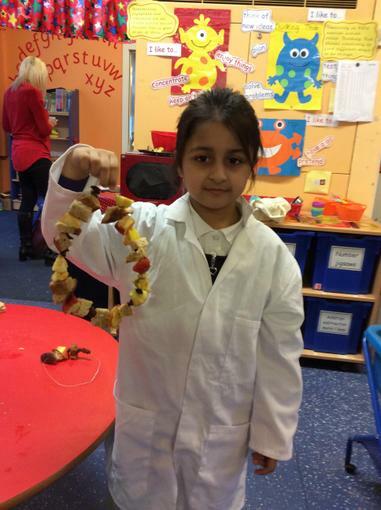 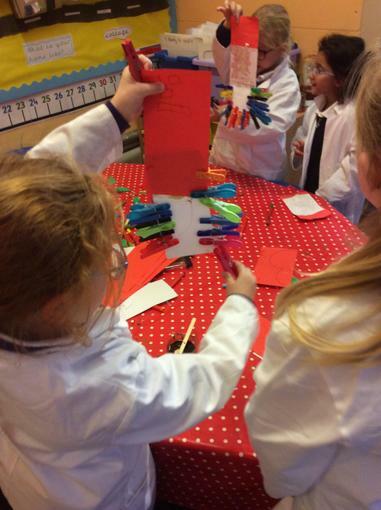 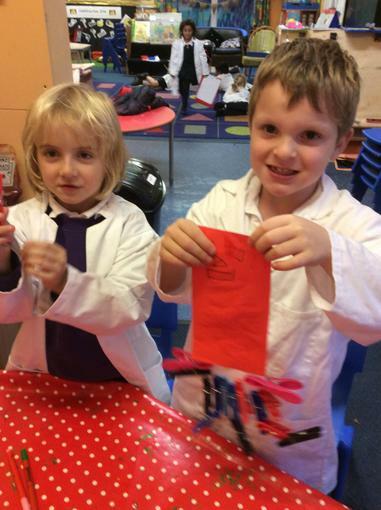 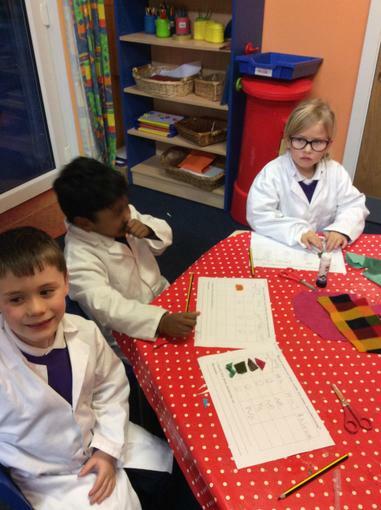 Science club is for children in Year 2. 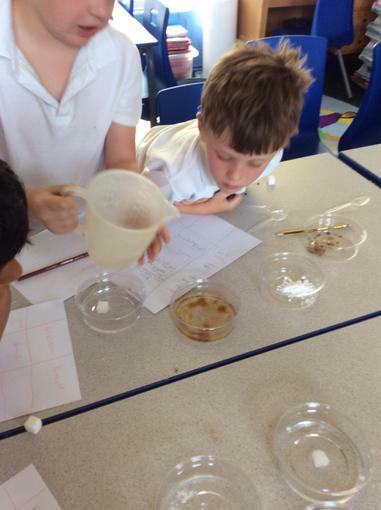 Each week we have a different investigative challenge. 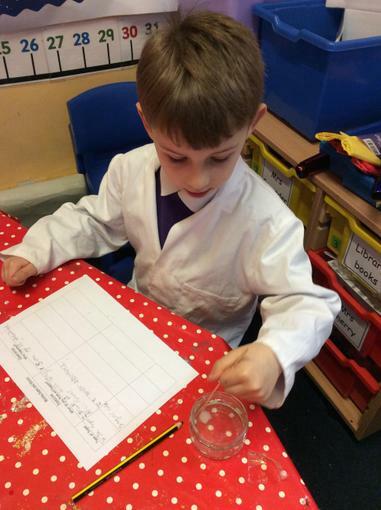 We are collecting stickers on our science passports as we work towards our Crest Science Star Awards. 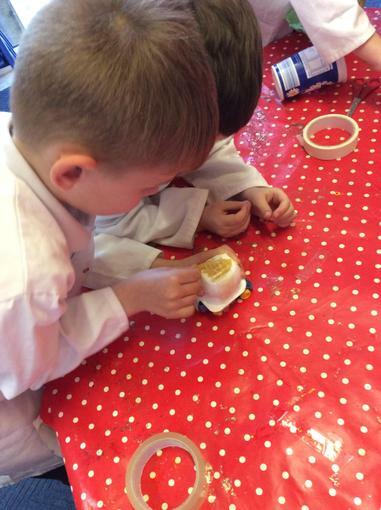 No-Bot needs to stick his bottom back on but he hasn’t any glue. 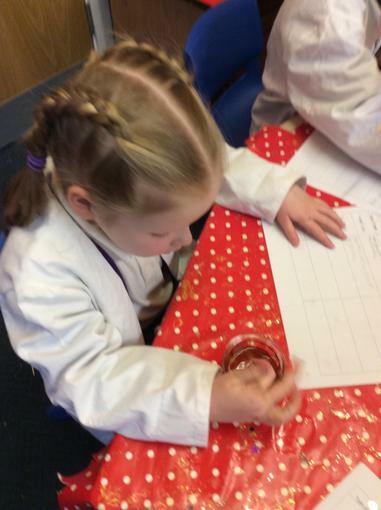 We investigated what No- Bot could use instead... ketchup, syrup, jam, lotion, margarine, soap or conditioner. 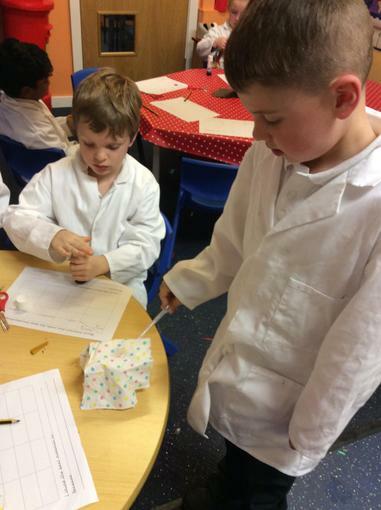 We used pegs as weights to find which made the strongest glue. 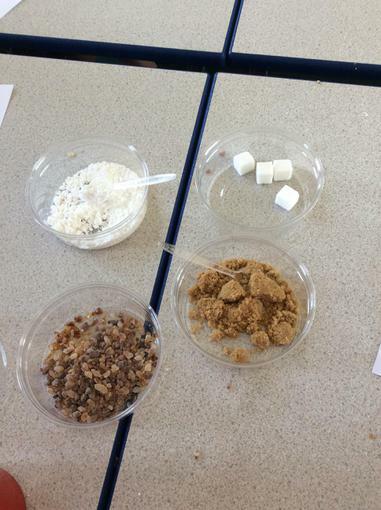 We used the Easiscope to look closely at different types of sugar. 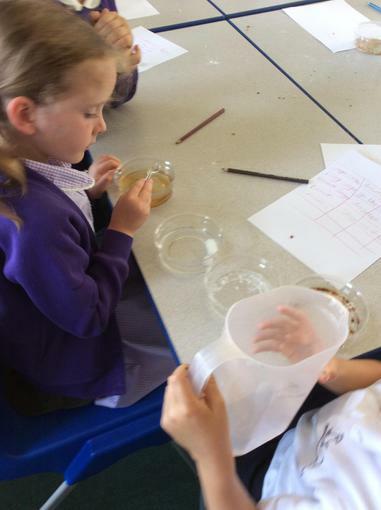 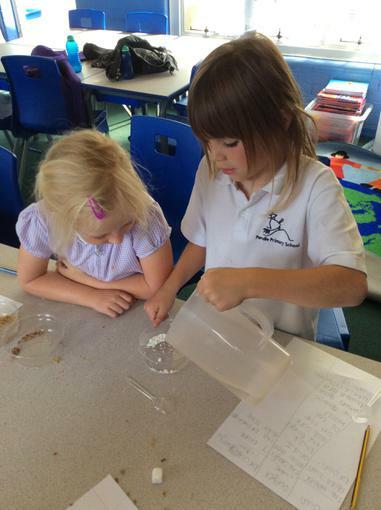 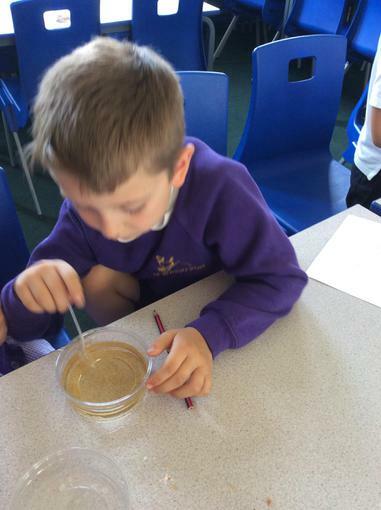 We made predictions and then investigated what happened when we put the sugars in water. 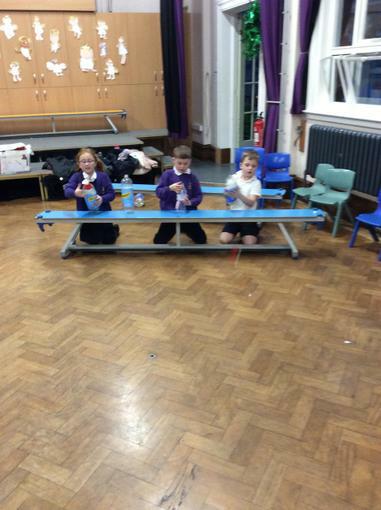 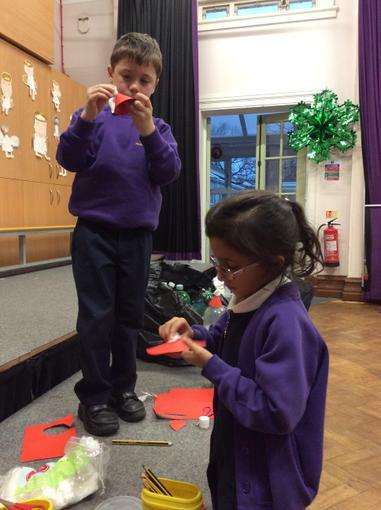 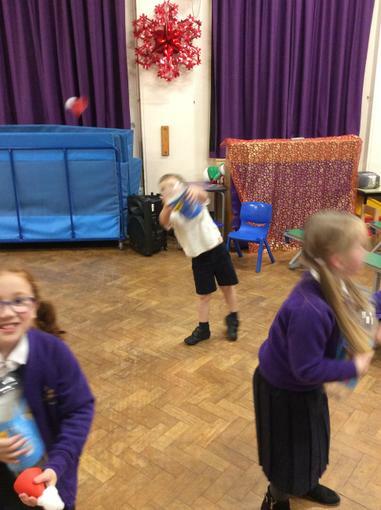 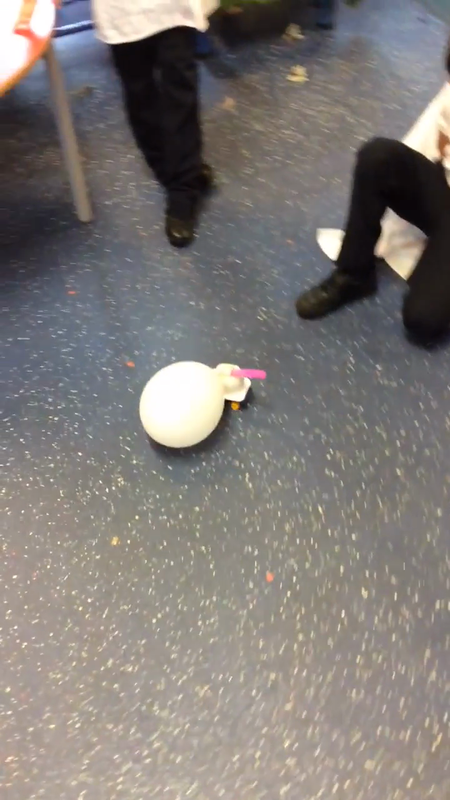 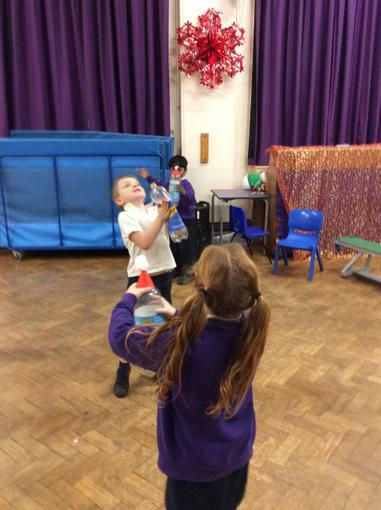 We made cone shaped Santa hats and made them fly by forcing air out of plastic bottles. 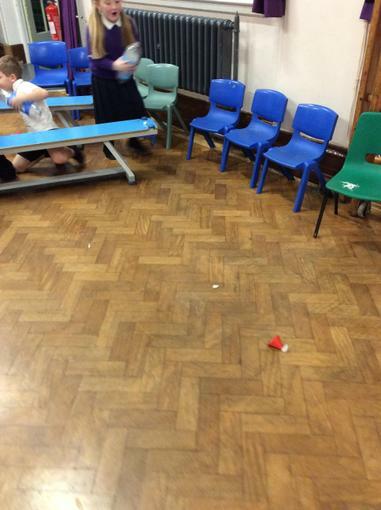 Who can make their hat go the furthest/ highest? 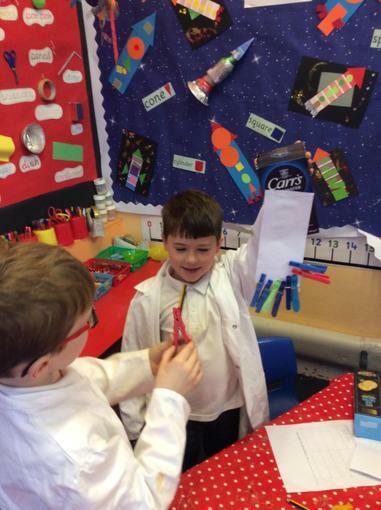 We discussed what would happen if we used a smaller bottle or changed the size of the hat. 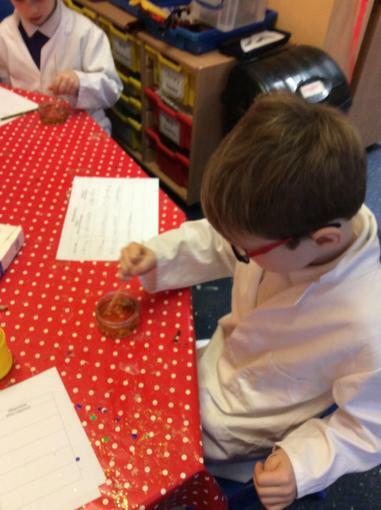 Something to try at home! 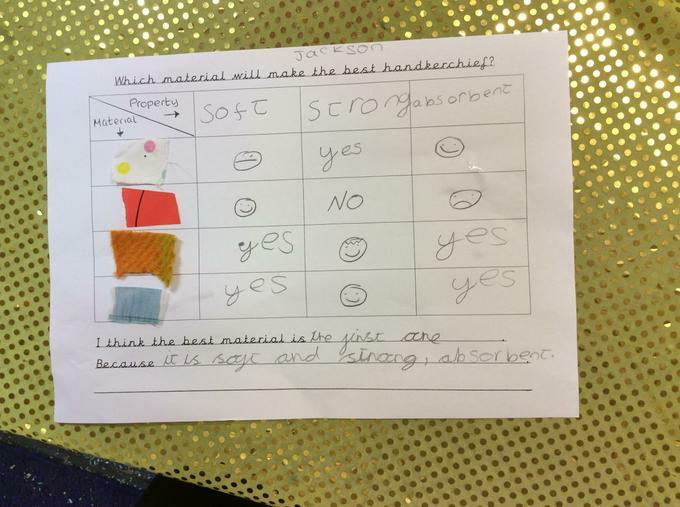 We chose which properties we thought were important when choosing a material for a handkerchief. 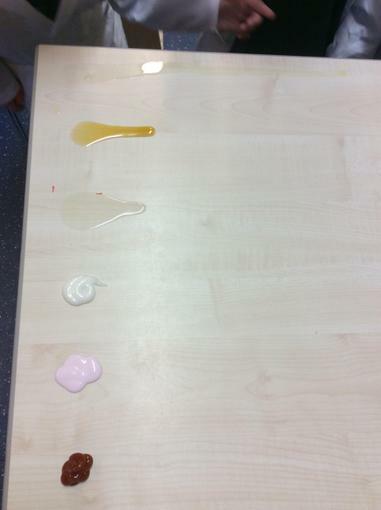 We tested different materials and discussed our results. 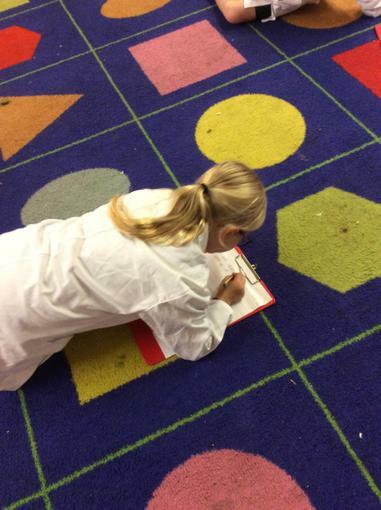 This week we have been practising our observational skills. 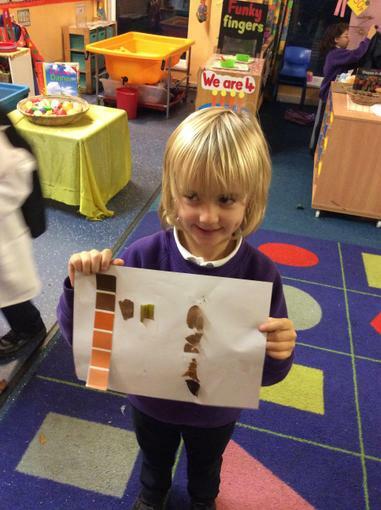 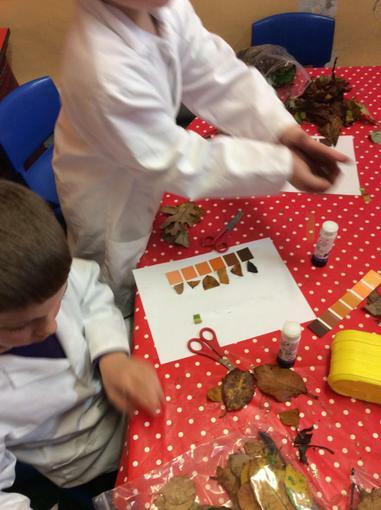 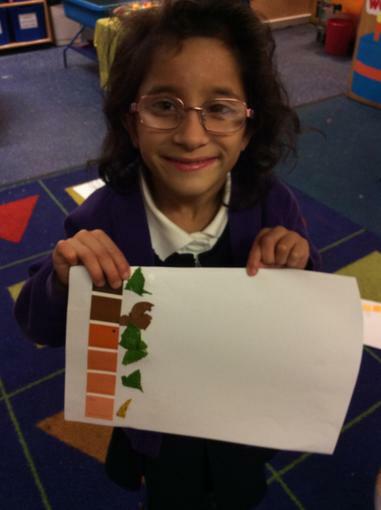 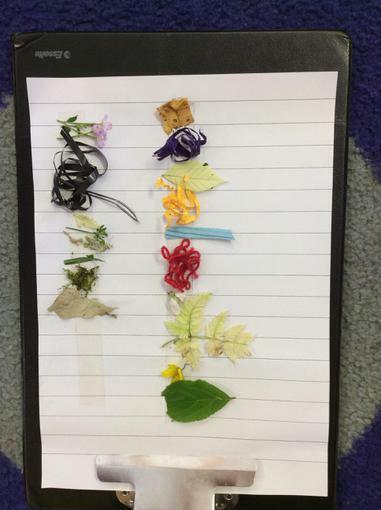 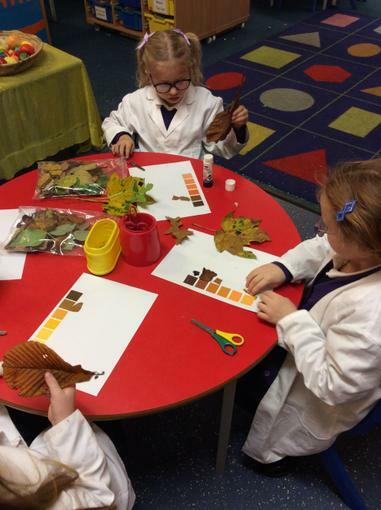 We collected leaves from the wildlife garden and tried to match the colours to paint colour charts. 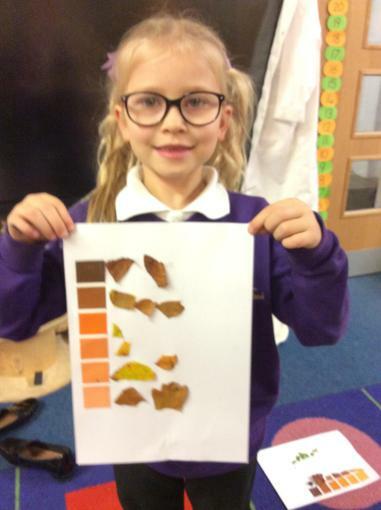 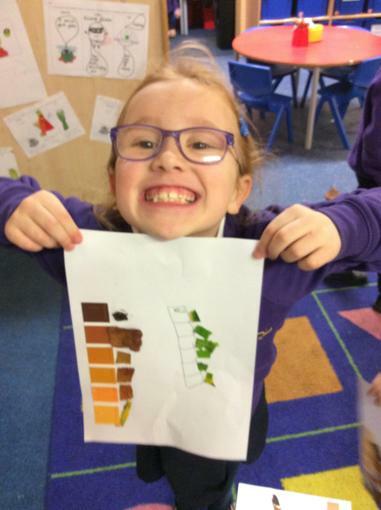 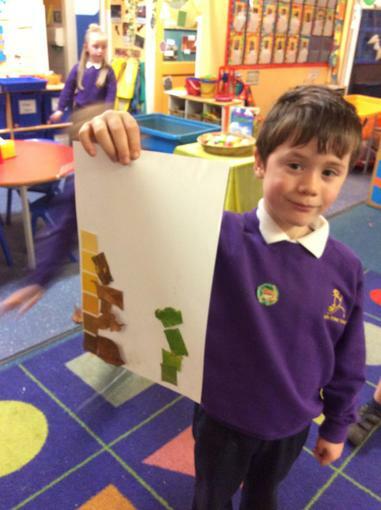 We made our own colour charts with different leaf shades. 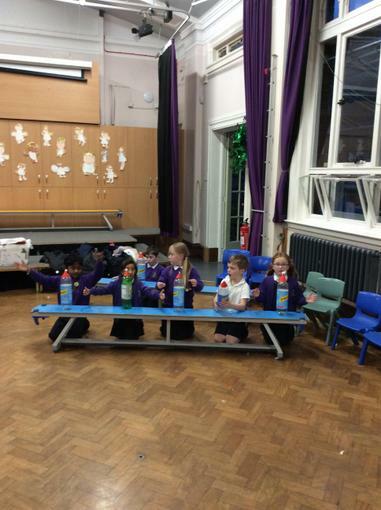 We compared different liquids before racing them down a slope. 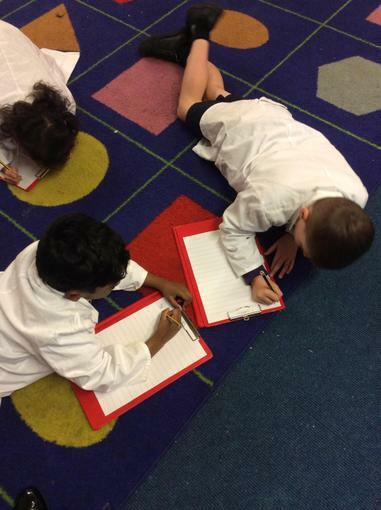 We talked about planning a fair test. 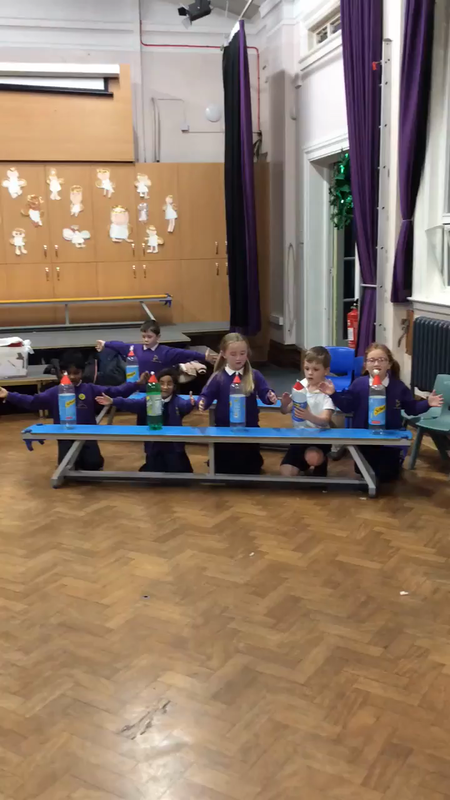 We made predictions and then used stop watches to record the time each liquid took to reach the finish line. 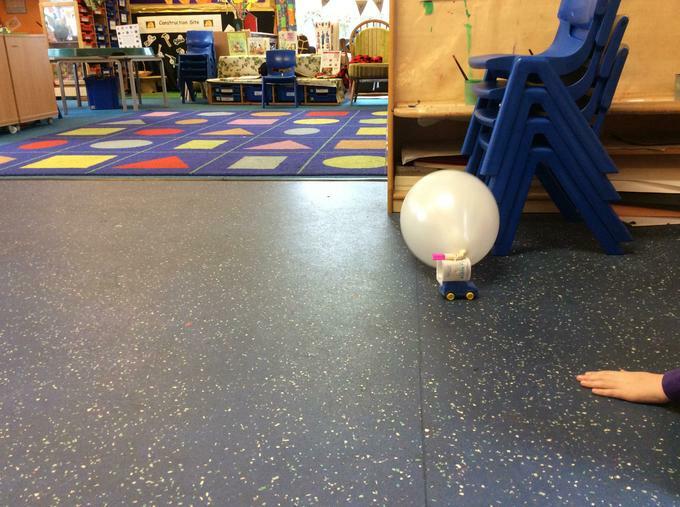 No-Bot the Robot's bottom has fallen off! 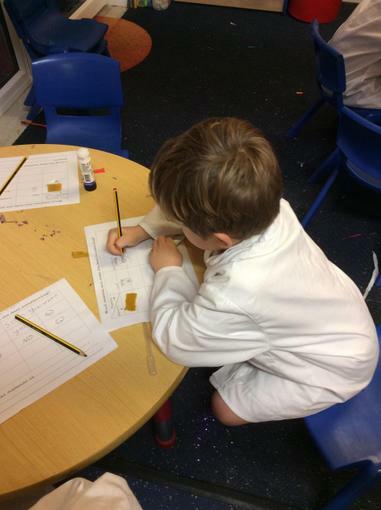 What can he find in his kitchen to stick his bottom back on? 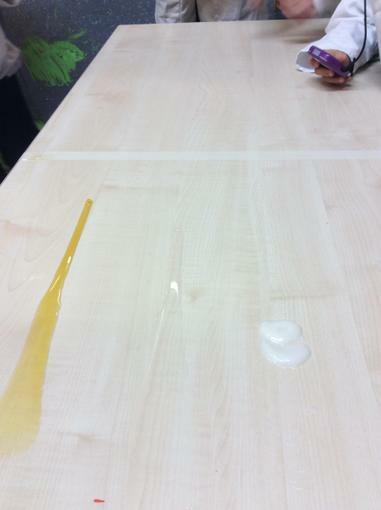 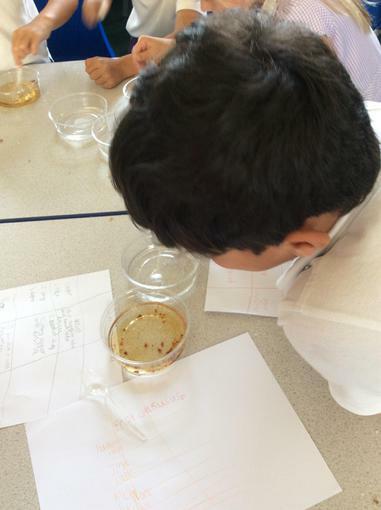 We tested butter, ketchup, syrup, treacle and washing-up-liquid, using pegs as weights to see which was the strongest glue. 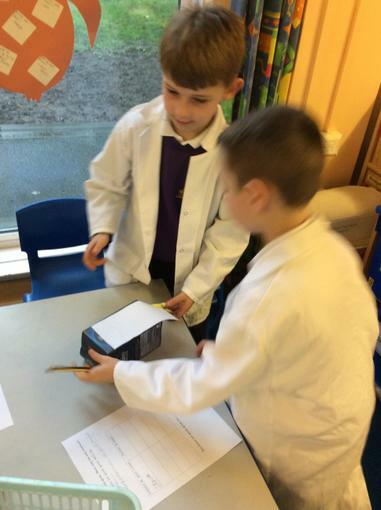 We recorded and discussed our results. 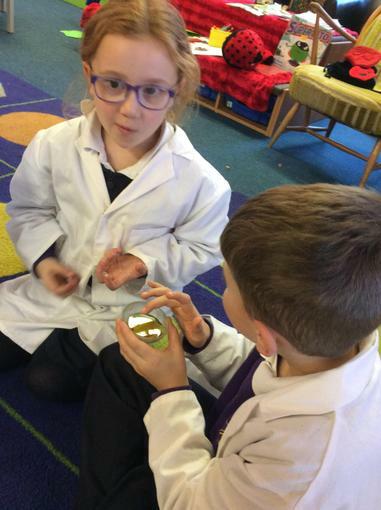 Asking questions helps us learn about the world around us. 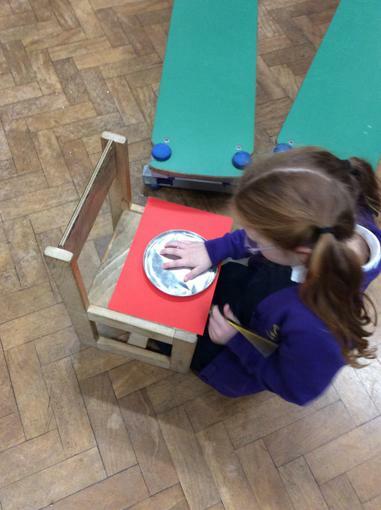 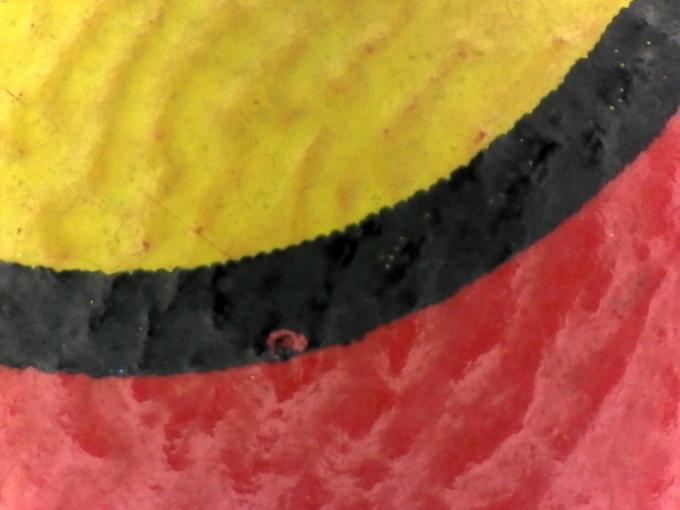 We have used the 'Easiscope' to zoom in and look carefully at different objects. 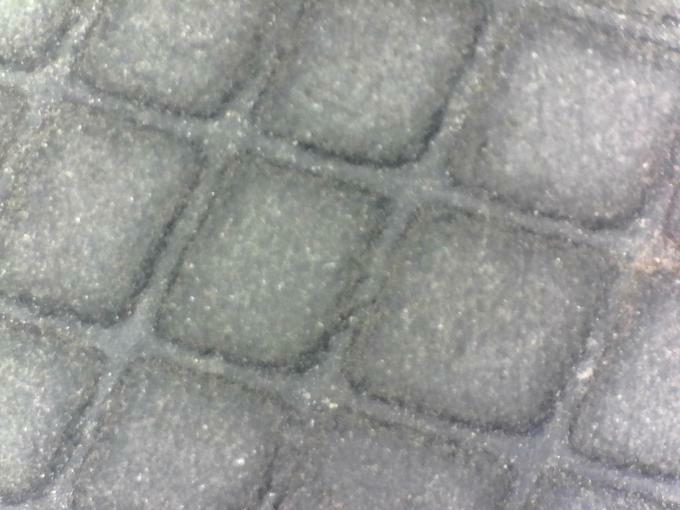 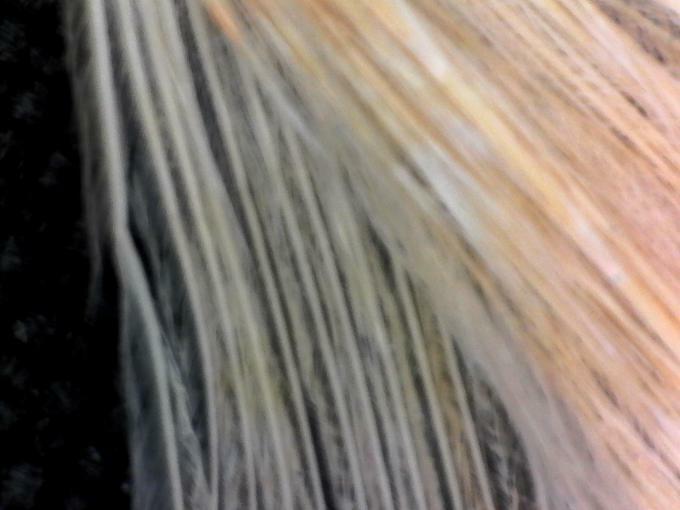 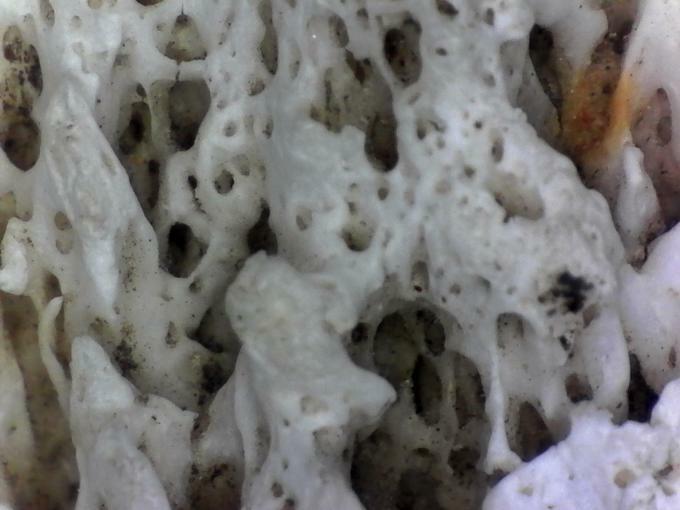 Can you tell what they are? 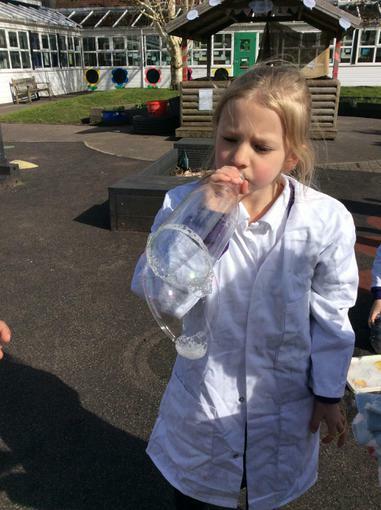 Can you make a water timer that lasts for one minute? 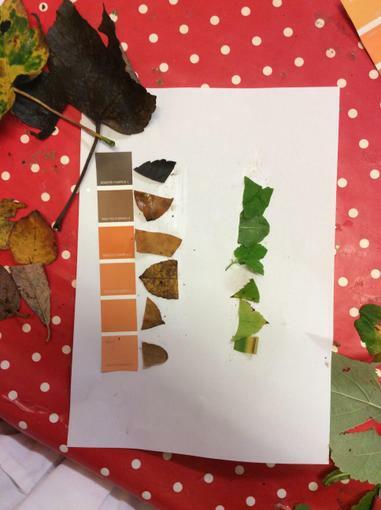 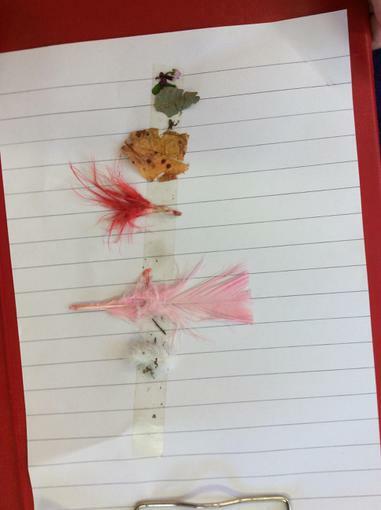 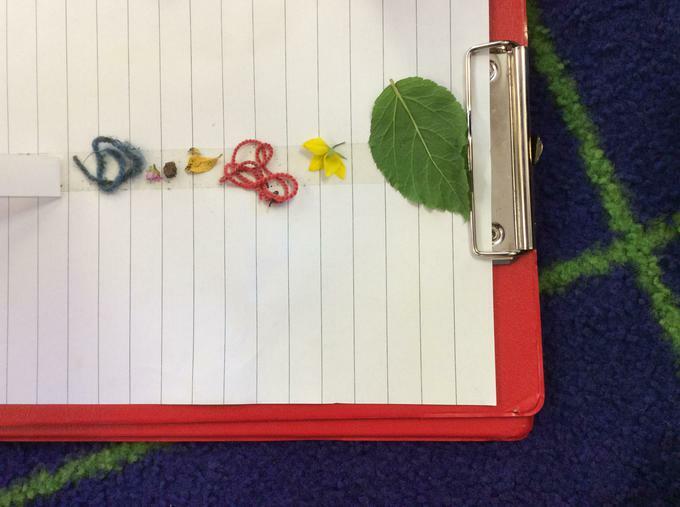 This week we went on a leaf hunt to identify trees in the school grounds.We compared the leaves on different trees. 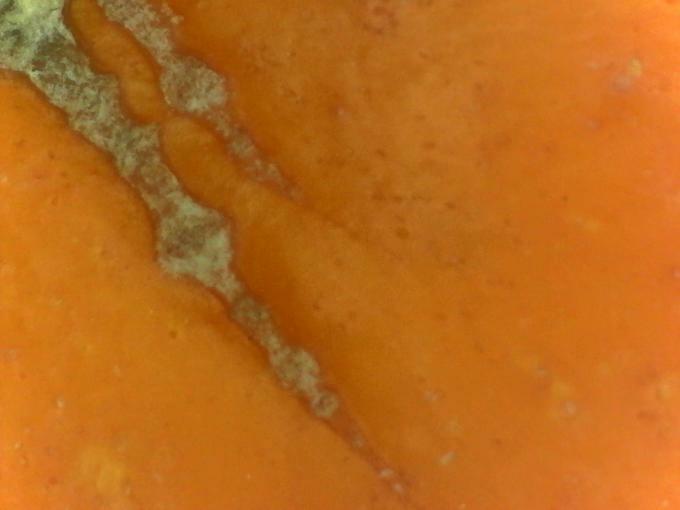 some were thick and smooth like leather. 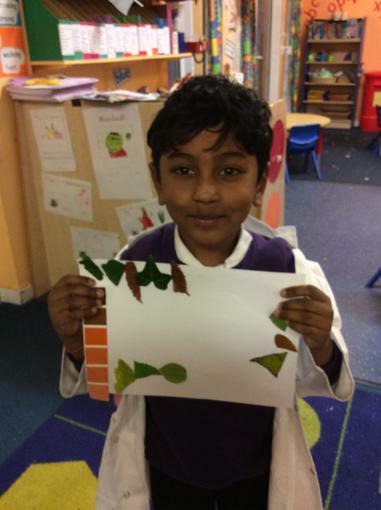 The new leaves were softer and thinner. 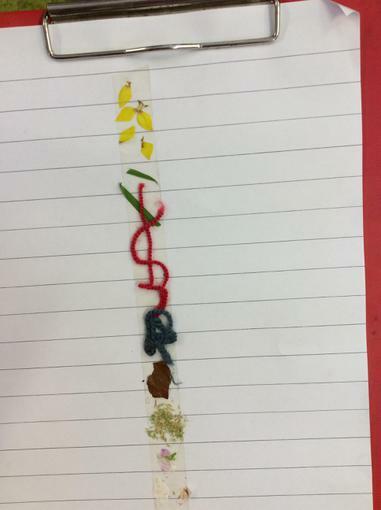 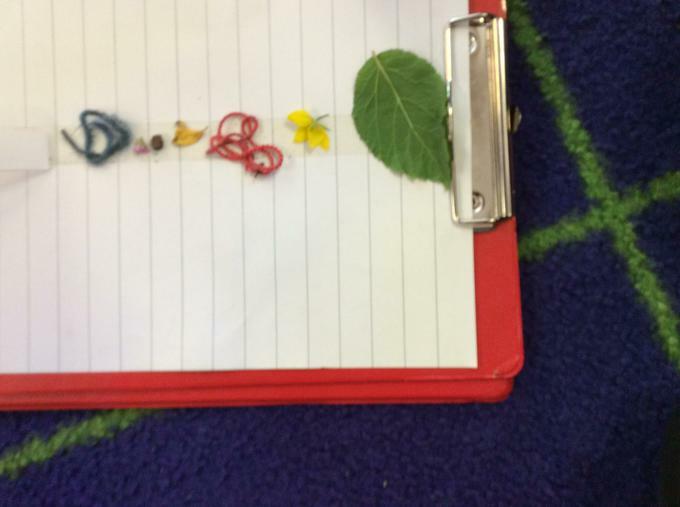 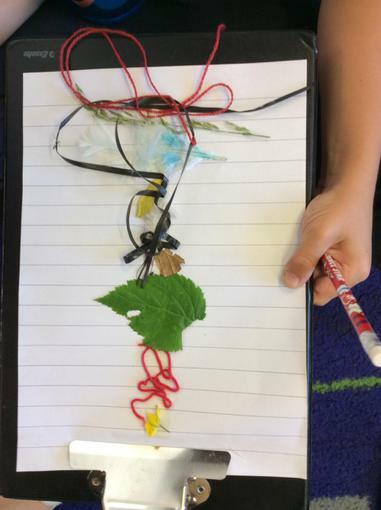 R. thought the leaves were a bit like us because they grow and change colour and the baby leaves are soft. 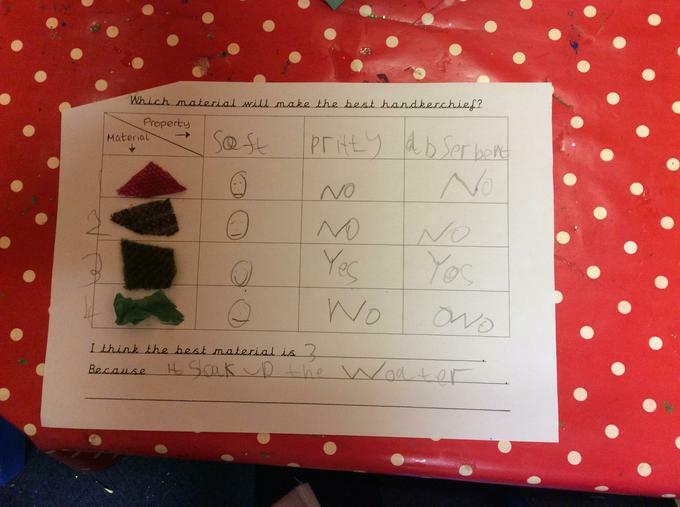 We investigated which material would make the best hankie. 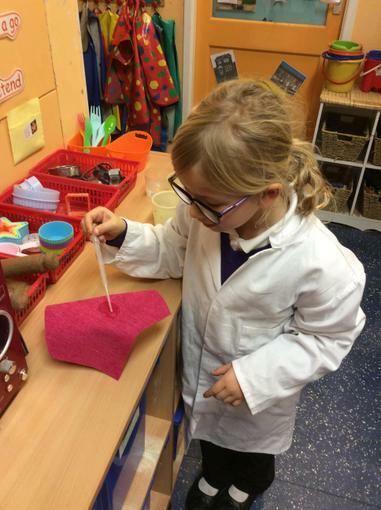 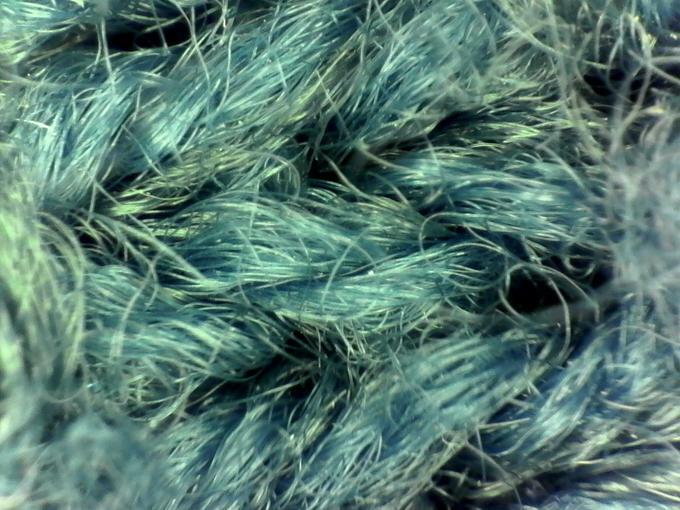 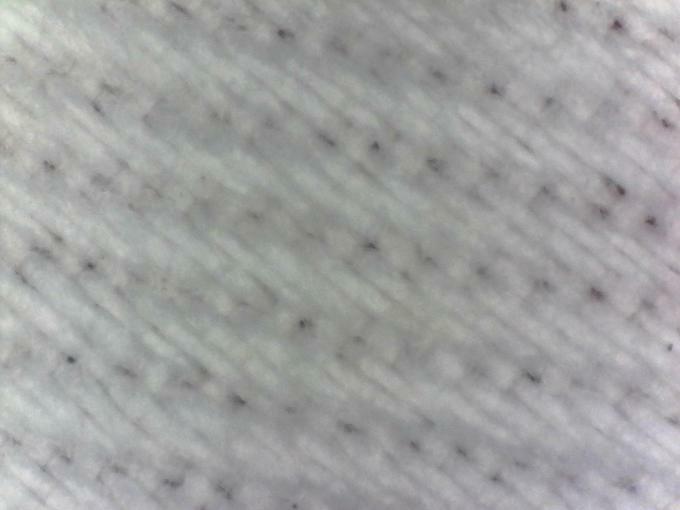 We decided a hankie needs to be soft, strong and absorbent. 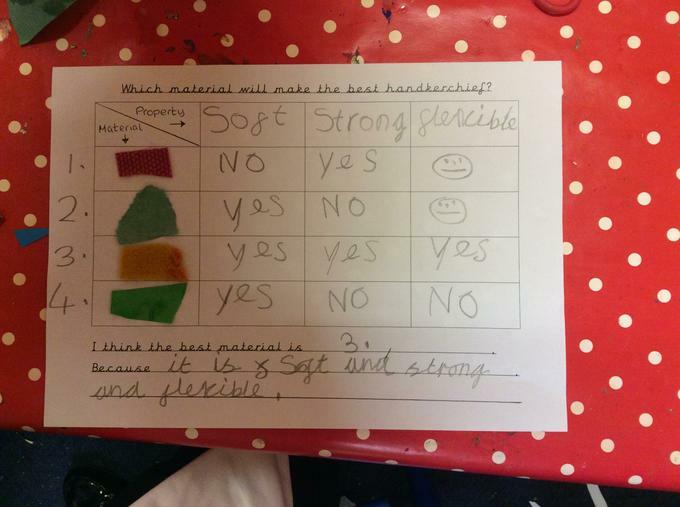 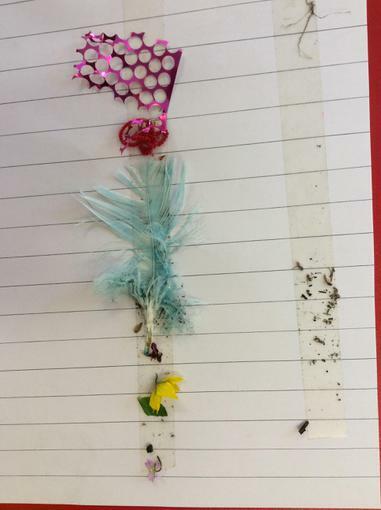 We tested the materials and shared our results. 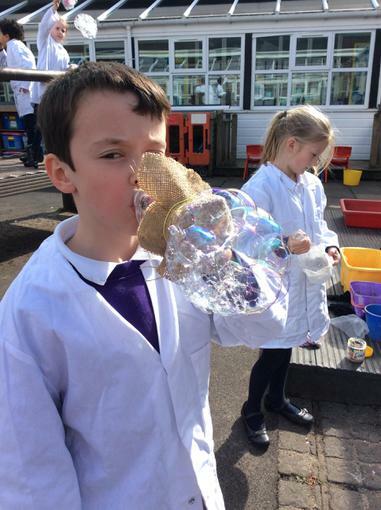 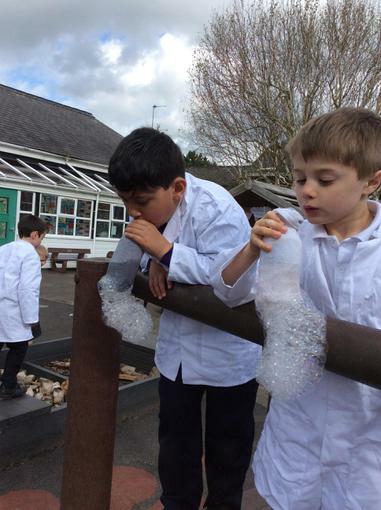 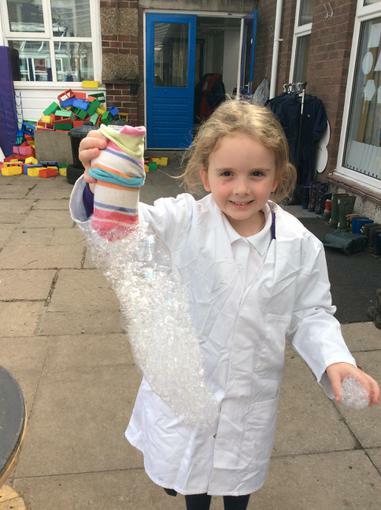 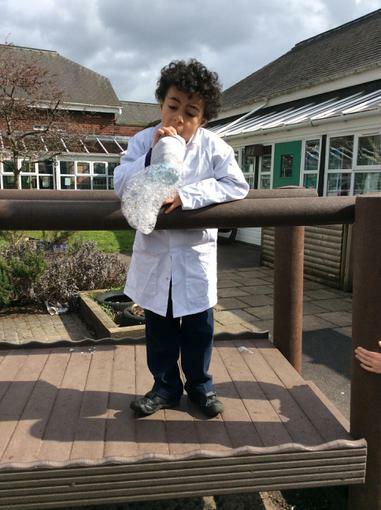 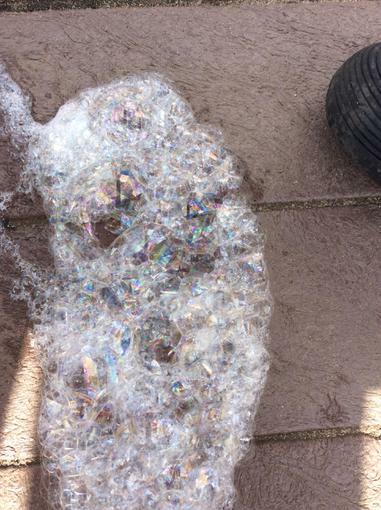 We investigated how we could change the size and shape of the bubbles we made.